Throughout its history, Miami has been a magnet to visitors and newcomers from around the world. But rapid growth has come at a cost: development has created a dense, crowded city with little green space—just 2.8 acres per 1,000 residents, less than a quarter of the 12.4-acre national median. The Trust for Public Land is working with local nonprofits and government agencies to create parks that will transform urban Miami into a green, livable, and healthy city. Fitness Zone® installations: In many underserved Miami communities, obesity rates are disproportionately high and access to fitness facilities is limited. To create more opportunities for physical activity, we are outfitting neighborhood parks with Fitness Zone installations: custom-designed, easy-to-use outdoor gym equipment featuring health and fitness information in Spanish, English, and Creole. 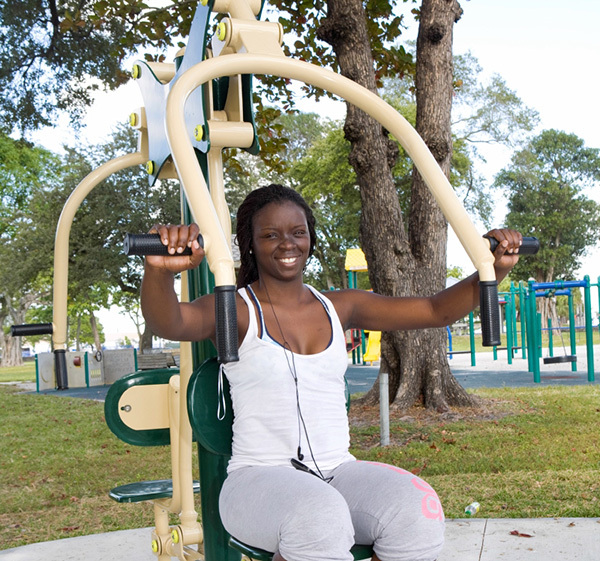 In July 2012, we opened our first Miami Fitness Zone® installation at West Perrine Park. We will continue our partnership with the Miami-Dade Parks and Recreation Department to build new Fitness Zone® installations in Oak Grove Park, Leisure Lakes Park, and Martin Luther King Park. Downtown Corridor: We are helping to create a green space corridor that will connect Museum Park on Biscayne Bay with the Adrienne Arsht Center for Performing Arts, extending all the way to the University of Miami School of Medicine through the culturally rich—but currently underserved— neighborhood of Overtown. Parks and Transit: Our planning and mapping experts are helping the county identify vacant properties to transform into new parkland along Metrorail lines and the Miami River. Parks and Nature Preserves: We are working to bring green space to underserved neighborhoods like Liberty City with high proportions of low-income and immigrant families—the places where better parks are needed most.